Teachers need to have deep insight into their students’ learning in order to provide the best instruction, including what work students have done in the past as well as how they are doing in other classrooms. 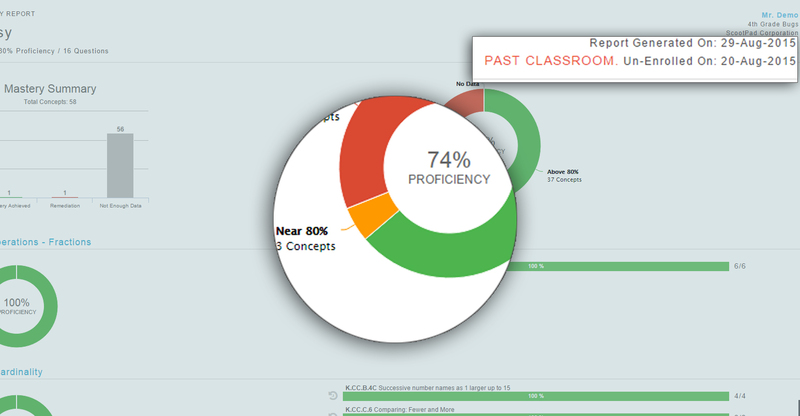 We’re excited to announce our newly released Historical Mastery Report which provides teachers with a detailed past and present report on each student’s proficiency, drilled all the way down to each concept. This is a powerful tool for teachers to use to identify learning trends throughout the student’s ScootPad history. Unlike other platforms, ScootPad won’t archive student data at the end of each school year and keeps all insight on past performance accessible. New classroom, new school, no problem – the data will remain safe and secured with the student account so long as it exists. It’s your data. We let you decide what to do with it.